It is important for the longevity of this product that the wood fired oven is ‘seasoned or cured’ correctly. When firing your oven for the first time, it is vital that heat be built up gradually. We strongly recommend the use of heat beads or similar, as your heat source for seasoning your oven. These materials burn consistently, and enable you to take longer breaks in between inspecting and topping up your seasoning fire. Day 1. Initially fire up a pile of charcoal beads or tablets approximately 20 cm diameter, so that it burns with a low, small flame. Keep this initial firing burning consistently for approximately 24 hours; (last to bed tops up the fire, as does the first to rise the next day- not allowing the oven to completely cool down at any time). Day 2. Grow your pile of beads so that it now has an approximately 22 cm diameter; (once again maintain this fire as consistently as possible, for the second 24 hours of seasoning). Day 2/3 firing Day 3. Grow your pile of beads so that it now has an approximately 30 cm diameter; (once again maintain this fire as consistently as possible, for the third 24 hours of seasoning). Do not allow the flame to touch the inside surface of the oven dome during this first 72 hours. This process is meant to gradually dry out and equalise the moisture content of the oven components. The process should therefore be not too rapid, not too hot, as the long-term performance of the oven may be affected. Ready for pizza Day 4. Your final day of curing! During the course of day 4, keep gradually increasing the heat intensity of your fire. Towards the end of the fourth day, celebrate by adding hard wood logs, split in two or three, (approximately the size of shoe), so that your oven gets hot enough for pizzas. You can tell you have reached that temperature by observing that the inside surface of the oven should be near white in colour. Seasoning can then be considered finished. Important: Do not neglect this seasoning process, as the long-life and effective use of the oven may be compromised. How long should it take to fire up the oven? 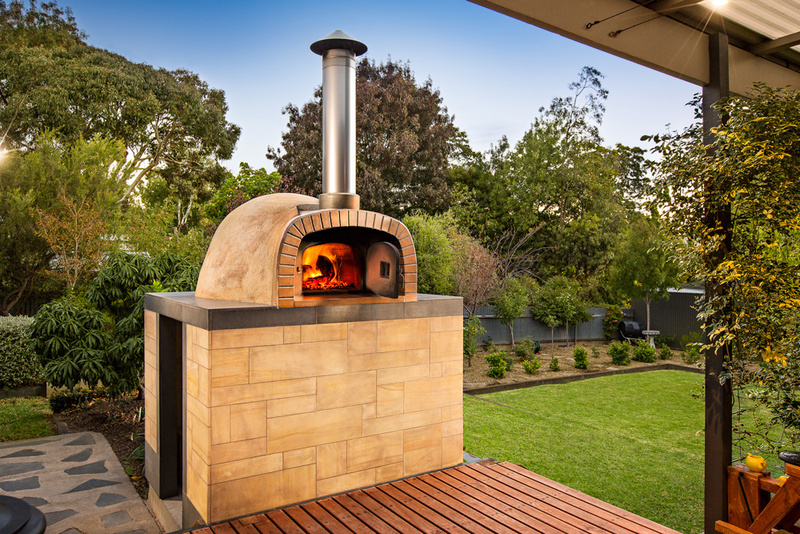 A domestic wood oven, dependant on size will range from 20 minutes to 1 hour depending on the size of the oven to achieve cooking temperature. Should my oven produce smoke? Smoke at some stage in the firing process is completely normal. You can reduce the amount of smoke by using wood of a kindling size. Never the less, there is always at least one point where smoke is produced – as the flame’s maximum temperature is reached, smoke is produced by expanding gases within the burning wood. At this stage, quite often the whole inside of the oven is also filled with flame. What is the best wood to burn? Pine and general kindling is best to use to initiate the fire, then hard wood logs should be added to increase the temperature. Do not use man-made woods (particle board, MDF &c), painted or glued timber, or timber that has been treated with chemicals (perma pine for example). Pine burns very quickly, but also quite hot, so pine may be used to fire the oven hot and fast. What do I do once I start the fire? During firing the door is left open, allowing oxygen to help fuel the fire and allowing any smoke produced to escape through the flue.